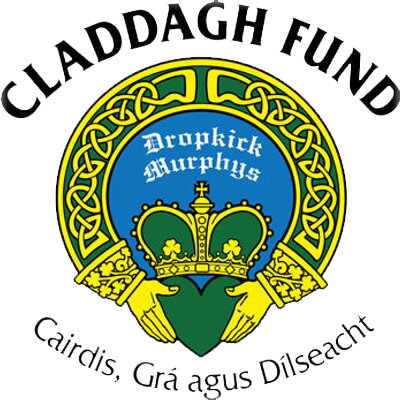 The Claddagh Fund is the charitable foundation of the Dropkick Murphys, founded in 2009 by band frontman, Ken Casey. The Claddagh Fund honors the three attributes of the Claddagh Ring: Friendship, Love & Loyalty. Our mission is to raise money for the most underfunded non-profit organizations that support the vulnerable populations in our communities. Help support the cause! Chose to make this a one-time donation or a monthly donation. Monthly donations will automatically charge your credit card the 1st of the month for the amount you specify. The Claddagh Fund was founded in Boston in 2009 by Ken Casey of the Dropkick Murphys. Ken, his bandmates and their families have supported charities throughout the history of the band. Understanding the power of their position to harness the passion and generosity of their fans, the Claddagh Fund was created to raise funds for and broaden our impact on worthy, underfunded non-profits that support the most vulnerable individuals in our communities. In August of 2011, Claddagh Fund and Dropkick Murphys announced the expansion of their charitable foundation to the city of brotherly love. In continuing The Claddagh Fund's mission, the Philadelphia Chapter will seek to assist the most underfunded non-profit organizations that support vulnerable populations in our local communities. Claddagh Fund Philadelphia strives to make an impact in our own neighborhoods by means of raising awareness and funds to invest and support those local charities that continually strive to improve the lives of our neighbors, friends and family. All funds raised through the Philadelphia Chapter are used to support local charities in our community.